Who doesn’t love a farmer’s market? The colors, sounds and atmosphere are lively but relaxing. The experience can be highly cathartic. And of course, there’s the opportunity to support local farmers and food entrepreneurs. August 5-11 is National Farmer’s Market Week, and I plan to hit the local circuit and visit as many as I can! There are some terrific entrepreneurial success stories where humble beginnings can be traced to the local farmer’s market. It all makes sense, right? Food and product entrepreneurs get to personally see and hear how customers respond to their creations, and act on that feedback. 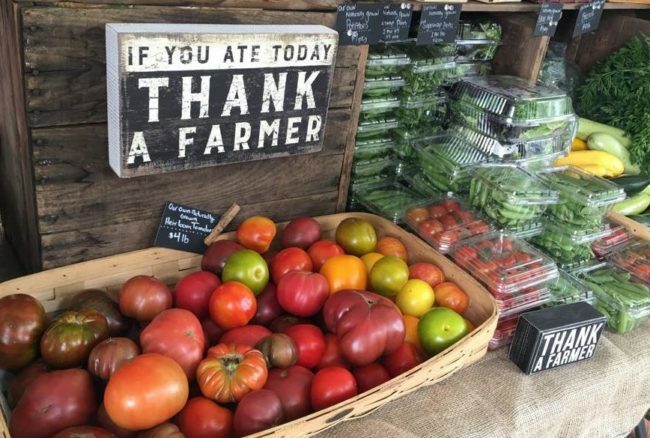 Did you know that grocery stores and big chains regularly visit farmer’s markets to get ideas and find new products to sell on their shelves? I love the personal stories behind entrepreneurial success, and here are just a few that had their start at the farmer’s market. Sierra Sage, which launched in 2009 with no seed capital, went from the farmer’s market to local retailers. Now, its products can be found in more than 2,000 retailers, including Target and Walmart. The women-owned, family operated business produces salves sourced from organic farmers. Founder Jodi Scott and her family made key financial sacrifices along the way, including selling the family’s bed-and-breakfast to help fund Sierra Sage’s growth. The company sold its products, including Green Goo – one of its most popular – at local farmer’s markets for two years. Now, Green Goo and their other salves are everywhere. Sierra Sage was recently certified as a B Corp, which is “an acknowledgment of the company’s commitment to social and environmental ethics, transparency and accountability,” according to the company’s website. Read more about Sierra Sage’s story in this Forbes Magazine article. Entrepreneur Neal Gottlieb, whose company believes in life, liberty and the pursuit of amazing ice cream, learned an early business lesson the hard way – he chose a bad retail location that offered little foot traffic. That’s when he took his organic ice cream straight to the people, the Berkeley Farmer’s Market. Business picked up and so did Gottlieb’s spirits. Whole Foods soon discovered Three Twins Ice Cream and started selling the food product in 2009. Even though his company has markedly expanded, Gottlieb continues to have a presence at the farmer’s market. According to this CNN Money piece, his parents work the booth. Justin, the name and person behind this culinary nut-butter company, said: “My roommates thought I was totally crazy.” Welcome to the world of entrepreneurship, where loved ones question your sanity and purpose in life. Thankfully, Justin’s passion and sense of purpose persevered and within 10 years he built an amazing company. He began making the nut butters in his kitchen, and his roommates ate their own words – well, actually Justin’s nut butter – which forced him to put “Justin’s-Do Not Eat” on each jar. He was encouraged to start his own business, got some training and mentoring, used a larger-sized kitchen to produce a greater volume of nut butter jars, and hit the Boulder Farmer’s Market in the spring of 2004. Justin’s butters were big hit and he began selling in local retail stores. Soon thereafter, he created nut-butter packets and new flavors. His growing company has been recognized on the Inc. 500/5000 Fastest Growing Company list and Ernst and Young named him an Entrepreneur of the Year. Read more on Justin’s story in this Inc.com piece – Case Study: From Farmer’s Market to Whole Foods. How to Sell Food at Farmer’s Markets, The Balance Small Business. 25 Tips for Small Businesses Selling at a Farmer’s Market, Small Business Trends. Beyond Artisanal: How To Grow a Niche Food Business, Forbes.